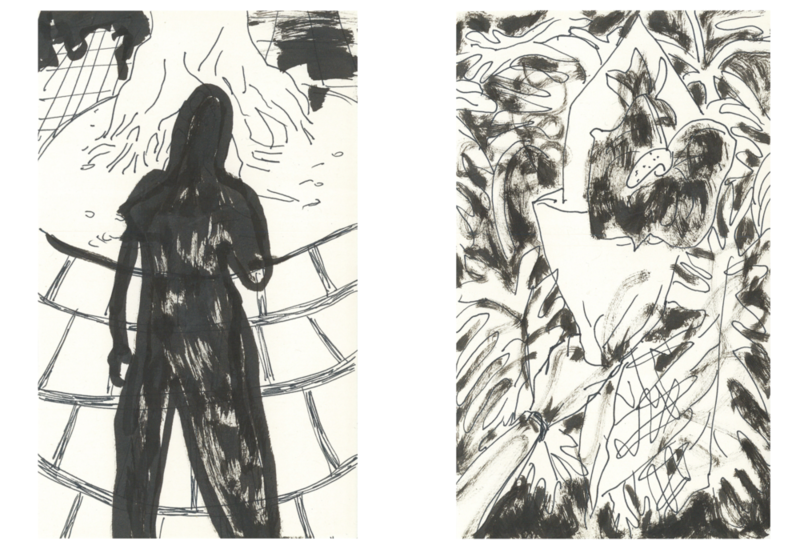 Last year Lauren Moya Ford launched her risograph book Nine Postcards and a Love Letter at Desperate Literature, a small independent bookshop in Madrid. There was a melodic quality to the reading, as Irene de la Torre Perelló followed Lauren’s excerpts with a Spanish translation each time. I was also fascinated to learn about the friendship that had developed between the two women during the translation process. Now, Lauren has recently translated The Rural Island by Irene de la Torre Perelló and in return, Irene has translated Lauren’s new book Ocean Air. Originally from Texas, Lauren is an artist, translator, and writer based in Madrid. 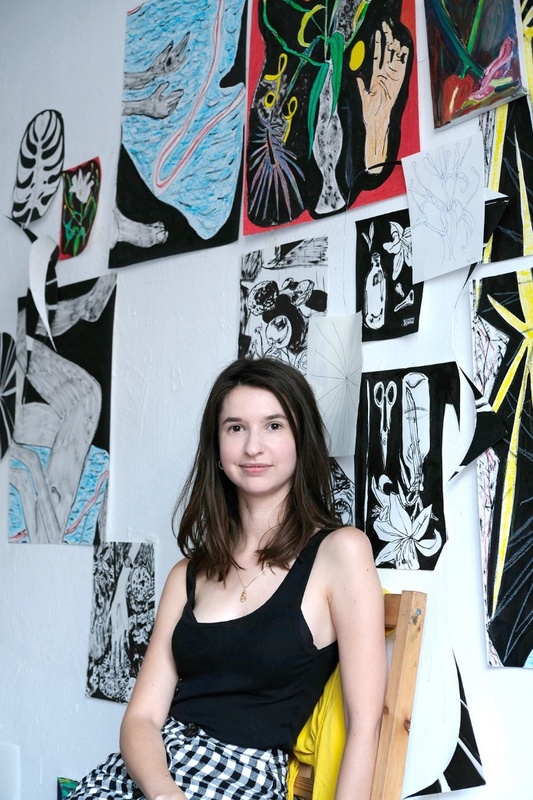 Her visual art and performances have been featured at The Menil Collection, Temple University, and MCO Contemporânea, and she has presented her writing at Front Gallery, Inc Livros, and Desperate Literature. Her work has appeared in Gulf Coast Journal, Fields Magazine, and Asymptote, and her essays have been featured in exhibition catalogues in galleries, cultural centres, and museums in Spain, Portugal, and the United States. Ocean Air recounts her six-week residency on Gran Canaria. Through a series of textual reflections, poetry and drawings, Lauren traces her experience on the island. In Ocean Air you ponder what makes a paradise. The generalised perception of a paradise is often a sense of quiet and a pristine landscape. But your initial impressions of Gran Canaria were quite different. Can you tell me more about that? Yes, it made me realise that even the definition of an island for me had a very specific look to it. I imagined it would be green with palm trees. The city where I was living was called Las Palmas so I had this idea that there would be a tropical, humid environment, with lots of flowers and greenery and fruits. The idea of the island is linked to paradise because it’s an escape, and silence, and distance from the real world or other people. I was surprised by the context that I was in. It was much more urban and diverse, which was interesting. That city has folks that are living there from Africa, from the peninsula of Spain. The largest Korean population in Spain is actually in the Canarias and there’s an Italian community too. It was a series of surprises that didn’t have much to do with a hammock and a palm tree and the simplistic idea of what an island in my mind could be. Why did you choose Gran Canaria? I was chosen. In terms of open calls and residencies, there aren’t a lot of opportunities for people that are from outside of Spain. This one was looking specifically for international artists and it’s an arts centre on the island. They invite one artist for six weeks. I didn’t realise I’d actually be living in the same place I’d be working. I was in the middle of downtown, right across from the casino. It was a very immersive experience. In Ocean Air I say at one point I was ‘an island in an island’ because I was living and working in a place that, for everyone else, was just a temporary space for a job. But I was forced to stay there – I didn’t have a place to retire, and withdraw, and be private. I had the impulse to go and explore and make a body of work, while also feeling like I’m a tourist and a fish out of a water. At one point you say ‘I’m here to examine the island, or examine myself, I’m not sure which.’ What is it about the island setting that lends itself to introspection? I think there’s something really special about being bound by the sea. Every street you look down ends with water and air. There’s something about that vastness – like when you’re on the island, really high up, and you see a single boat leaving. There’s something about physical restriction that puts you in a special condensed state, or level of focus. Being on an island can mean you feel that it is a contained space and you can explore everything. But on the other hand, it can be very despairing and lonesome. In the ‘Sunset’ section of Ocean Air you talk about your trip to the Italian island, Elba. You say that in the past, you had to visit a place to find out what it was like. Nowadays, we have ways of predicting our visits, through review sites like TripAdvisor and Booking.com. How much research did you do before going to the island? I think in that time the search engine wasn’t so advanced like it is now and I didn’t know much about Elba beforehand. I bought a guide book half price that I carried. I didn’t have a phone. Before I went, my friend, who I’d be staying with, and I used to email each other, long emails, that were more like letters. When I arrived, she oriented me in her way. It was a really strange lifestyle as you didn’t keep in touch with people back home and you didn’t have the accountability of being able to be pinged at any time. You were on your own and it felt so exciting as a young woman to be in that moment. Actually, at one point, I had a falling out with this friend and I just jumped on a train and went somewhere. That’s something that was invigorating at the time, but now, with all the tools we have, I’m not sure I would do the same thing. We’re not used to that kind of spontaneity anymore – we are used to researching fully, seeing the pictures, reading the reviews. It inhibits that level of surprise – I travel a totally different way now, much less freely. I was braver then. I felt I was an island in myself. You’re moving around with no link to the external world, so you feel less things outside can happen to you. In Ocean Air your words are interspersed with your artwork. All of the artwork is achromatic, including the shadowy figures of yourself. Is there a particular reason why they are all black and white? These drawings are all based on photos I would take during solo walks around the place. It was always interesting to me when I first arrived to see my shadow reflected on surfaces – it’s like an ephemeral trace that I can leave that means that I’m here and I pertain. For the last of couple of years it’s been very difficult for me to be in Spain, as far as jobs and visas go. I remember very clearly that after an unsuccessful trip to get another document renewed, where they told me you have done everything wrong and you are not legal here – I paid so much attention to seeing my reflection in the subway car, or the window of a shop. It was a reminder that I am here. I also loved seeing shadows of the palm trees which are everywhere in Las Palmas. They have a beautiful motion in the breeze and the way the shadows look at different parts of the day. The other thing you often see is my hand holding or examining something – it’s a way of taking ownership or intervening somehow with the landscape. I think those gestures appear a lot in my work because of my status as a foreigner. You talk about your summer vacations spent on South Padre where you studied the beach for shells all day. Do you have a favourite item you have found while beachcombing? In Texas our beaches are typically pretty dirty. There are a lot of oil platforms off the coast, so the water tends to be warm and brown and cloudy. You have a lot of tar spots and shells that are tiny shards. But one thing that we do have that is very special are sand dollars. They are called sand dollars because in the past American dollars also came as coins. It’s just a circle with a star inside and I think it’s a remnant of a sea creature. They are very mysterious: between a fossil, a stone and a shell. To find a full one of those is a boon because they are rare and fragile. Kat Coyle is a Glaswegian writer and teacher currently based in Madrid, Spain. She has had three short stories published in anthologies and is completing a novel set on Islay. She has vowed to visit at least one new island per year, usually in Scotland and England – she’s keen to branch out to Ireland and perhaps Germany this summer. She also enjoys maritime history and visiting lighthouses, most recently the Tower of Hercules in Galicia.